A file with the .DXF file extension is a Drawing Exchange Format file developed by Autodesk as a type of universal format for storing CAD models. The idea is that if the file format is supported in various 3D modeling programs, they can all import/export the same documents with ease. The DXF format is similar to the AutoCAD Drawing Database file format that uses the DWG file extension. However, DXF files are more widely used in CAD programs since it can exist in a text-based, ASCII format that naturally makes it easier to implement in these types of applications. 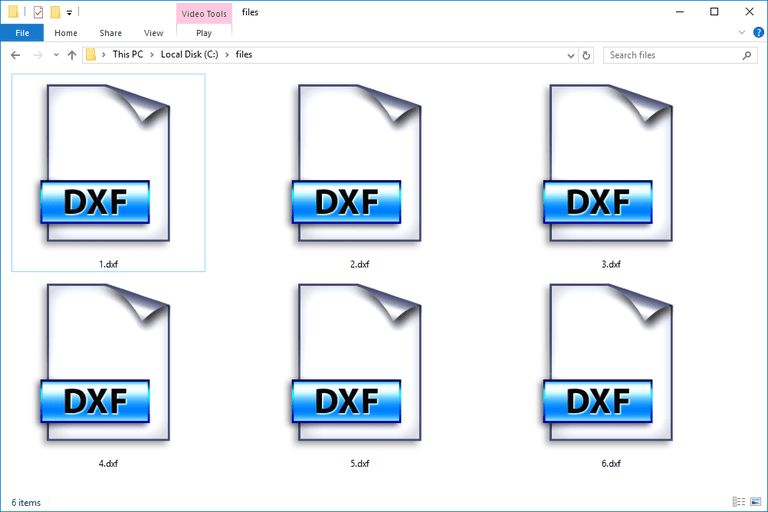 DWF files are similar to DXF files but are instead used to share files online or via a free viewer program, while DXF is for interoperability. Autodesk has a couple different free DXF file viewers available, including the online DXF opener called Autodesk Viewer as well as the DWG TrueView desktop program. There's also the AutoCAD 360 mobile app that lets you view your DXF files that are stored in online file storage services like Dropbox. eDrawings Viewer from Dassault Systèmes SolidWorks is another free DXF file opener. To quickly open a DXF file online, use ShareCAD. Some other DXF file viewers include Autodesk's AutoCAD and Design Review programs as well as TurboCAD, CorelCAD, CADSoftTools' ABViewer, Adobe Illustrator and ACD Systems' Canvas X.
Cheetah3D and some of the programs just mentioned will work for opening DXF files on macOS. Linux users can work with DXF files using LibreCAD. Since ASCII versions of the DXF format are just text files, they can be opened with any text editor. Doing this, however, does not let you see the drawing like you would in an actual model viewer. Instead, they'll just be several sections of letters and numbers. If none of these programs or services are opening your file, double-check that the file extension really does read .DXF and not something similar like DXR (Protected Macromedia Director Movie) or DXL (Domino XML Language), both of which open with programs unrelated to the CAD software mentioned on this page. Use Adobe Illustrator to convert DXF to SVG. Another option is to to use a free online converter like Convertio. Getting the DXF file in the DWG format (current and older versions) can be done with a trial version of AutoDWG DWG DXF Converter 500. You can only use this software for 15 days and on a single file at once. The eDrawings Viewer program mentioned above can save an open DXF file to a variety of formats like EDRW, ZIP, EXE, HTM, BMP, TIF, JPG, and PNG. To convert the DXF file to PDF, one option is to upload it to DXFconverter.org and choose the PDF option. That website also supports saving the DXF file to JPG, TIFF, PNG, and SVG. Bear File Converter might be useful if you want the DXF file to be in the STL file format. dxf2gcode can save a DXF file to the G-CODE for Linux CNC format with the NGC file extension. To use the text content of the DXF file with Microsoft Excel or some other spreadsheet software, you can convert the file to CSV with MyGeodata Converter. One of the DXF viewers above might be able to convert the file to a different format as well, like to an Adobe Illustrator file (.AI). Since the DXF format was released in 1982, there have been several changes to its specifications, which is why you might have one DXF file in binary format and another in ASCII. You can see a PDF of the specifications on AutoCAD's website. Recent versions of AutoCAD support both ASCII and binary DXF files. However, if you happen to be running Release 10 (which has been available since 1988, so it's unlikely), you can only work with ASCII DXF files. A typical DXF file is organized, in order, with a HEADER, CLASSES, TABLES, BLOCKS, ENTITIES, OBJECTS, THUMBNAILIMAGE and END OF FILE section. You can read all the details about each section in the PDF linked above. Scan2CAD and myDXF are a couple websites where you can get free DXF files.